Say you find yourself one day soon on a pleasant stroll through the Middlesex Fells by the Spot Pond dam. Among the swaying trees and skittering chipmunks, you notice a dilapidated rock wall, some remnant of the recent past. You might guess that it was once part of a grain storage shed or perhaps marked the property line for some long-gone Stoneham farmer. What you might not suspect is that you are looking at the ruins of a secret spy house set up by Timothy Sprague, an 18th Century mill owner, to catch rival mill owners in the act of trying to mess with his water supply – something he’d even dodged a bullet defending! 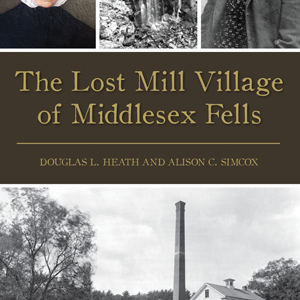 Controversy and litigation over water rights feature heavily in “The Lost Mill Village of Middlesex Fells” by Douglas L. Heath and Alison C. Simcox. The book meticulously explores the early history of Melrose, Malden, Stoneham and Medford through the rise and fall of a once thriving mill-run factory community. 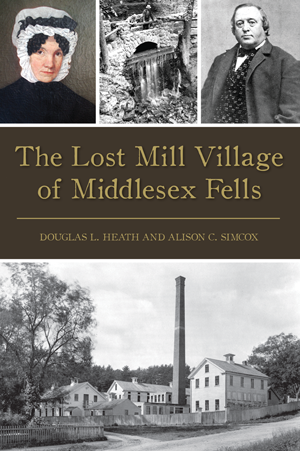 From corn flour and textiles to brass and rubber products, the mills of the Middlesex Fells grew to meet the needs of the expanding Massachusetts and American population, and at one time even housed its own school for factory worker’s children (who were often factory workers themselves). When Spot Pond was finally tapped for drinking water in the early 1900s, the factories were slowly abandoned, leaving behind the odd ruin for hikers to discover in the protected Middlesex Fells. 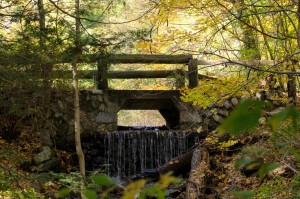 As Bay Staters, we are already blessed with a superabundance of American history all around, and “The Lost Mill Village of Middlesex Fells” introduces those just north of Boston to another interesting chapter of our ancestors’ experience. 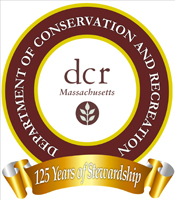 Alison C. Simcox and Douglas L. Heath are local environmental scientists with an interest in local history. They also wrote the Images of America books on Middlesex Fells, Breakheart Reservation, and Lake Quannapowitt. The authors are leading a historical tour out of the Virginia Wood gate at 1 Woodland Road Stoneham at 1pm on September 10th. They also expect to add a couple more event listings, so stay tuned! See our event calendar for more details. Great review, Phaea Crede! We are so lucky to have you on our team — so much fun learning more about the Fells.